Shiro-Khorshid Forever - شيروخورشيد تا ابد: The Iranian Embassy in Canada Should be Shut Down! 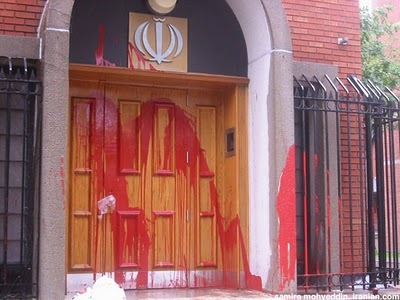 The Iranian Embassy in Canada Should be Shut Down! On July 8th 2011 Canadian Foreign Affairs Minister John Baird announced that Canada together with the United Kingdom and the United States is increasing restrictions on the Iranian authorities to hold them accountable for their international human rights obligations. Canadian government and non-government institutions. Toews scrambled to announce that the RCMP must keep clear of this and other hate fests. Other troubling RCMP outreach has occurred but, despite pleas from moderate Muslims and others, Mr. Toews has been helpless to force the issue. In January, Library and Archives Canada, our federal library, capitulated to Iranian pressure and cancelled a showing of the film Iranium. Protests by the sponsor, the Free Thinking Film Society, spurred the Canadian government to re-schedule the event. via an Iranian “cultural” organization – a lavish event at the Canadian taxpayer-funded NAC. scope of its diplomatic relationship with Iran. Nonetheless, its embassy continues to allow Iran a formidable base of operations in our midst. to spy on Canadians and manipulate policy and public opinion. It identifies and intimidates pro-democracy activists, with particular regard to Iranian-Canadian dissidents whose families in Iran may be vulnerable. Along with front organizations, embassy personnel penetrate our universities, and some “students”, boasting embassy connections, warn campus democracy activists not to get out of line. Iranian “volunteers” are joining immigrant-settlement organizations in order to spy on newcomers from Iran, rather than to help integrate Iranian immigrants into Canadian life, values and loyalty. The crisis is building; with a terror-linked Iranian brigadier general’s recent boast that Western countries are infiltrated by Tehran’s armed forces – and general recognition that Iranian Revolutionary Guard elements operate from many of Regime’s embassies. The embassy of Iran, like so many of its “cultural” and other offices, is a threat to the sovereignty and security of Canadians. It is time to shut it down. Sayeh Hassan is a Toronto-based criminal defence lawyer and a bloggeradvocating for human rights and democracy in Iran.